May 21, 2010: Earlier this month, Mars Exploration Project manager John Callas updated a NASA audience at the Marshall Space Flight Center about future prospects for the Mars rovers. Spirit, he says, is in peril from the advancing Martian winter, and Opportunity could soon run into trouble as the rover attempts a daring trek across dangerous terrain. Nevertheless, both rovers are still in the hunt for new discoveries. In other words, it's business as usual on Mars. 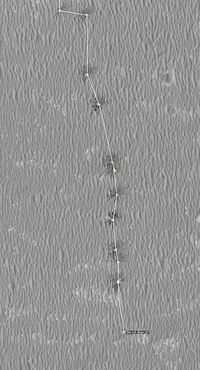 (Left) Tracks in the sand made by Opportunity. (Right) An artist's concept of the Mars rovers. His report began with the "lucky rover," Opportunity, which set the surface longevity record for Mars landers on May 20th, breaking Viking 1's old record of 6 years and 116 days. Opportunity is now inching her way across rough terrain toward the tremendous Endeavour crater â€“ a destination the team is eager to reach because it may contain the habitats of possible ancient Martian life. "These rovers were each designed to traverse about 1/3 of a mile total, yet Opportunity has already covered almost 13 miles," says Callas. "She'll have to almost double that to reach Endeavour. That's like racking up 2 million miles on your car's odometer, and then expecting to do that again, all without an oil change." Right now, Opportunity's cameras can see part of Endeavour's rim on the horizon, about eight miles away, across the ripples of windblown sand. "The ripples look like waves on the ocean, like we're out in the middle of the ocean with land on the horizon, our destination," said Steve Squyres, principal investigator for Opportunity and Spirit. "Even though we know we might never get there, Endeavour is the goal that drives our exploration." The rover team has a new trick up their sleeves to improve Opportunity's odds for reaching its distant goal. "We've been developing a computer model of the rovers to simulate their mechanics over Martian landscapes," says deputy principal investigator Ray Arvidson. "Throughout their mission, we've recorded the rovers' every move, so we have a history of their tilt, their wheel torque and slip â€“ everything we need to derive the mechanical properties of the soil they've traversed. And we've got good stereo images of the topography as well." The team has used all of this information to simulate the terrain Opportunity is facing now and determine how best to cross it. This software will help Opportunity avoid sandtraps (like the one where Spirit is stuck) and similar hazards to improve her chances of reaching Endeavour. "If we make it, we can sample a rock type we haven't come across on Mars yet," explains Callas. "The Mars Reconnaissance Orbiter has detected Phyllosilicates [clay minerals] at Endeavor. These minerals form under wet, warm, non-acidic conditions." A satellite map of Opportunity's ongoing traverse, updated May 20, 2010. According to Callas and Arvidson, these rocks are good for preserving organic material and even micro-fossils. "Up until now, all the evidence the rovers have found for ancient water has been very acidic water, which gives the astrobiologists heartburn," says Callas. "Phyllosilicates suggest the possibility for more neutral pH water to have existed. This would be very exciting for the possibility of ancient life on Mars." "If we make it, we'll be right on top of the oldest part of Mars -- ancient ground exposed, still preserved after 4 to 4 1/2 billion years," says Arvidson. Meanwhile, Spirit is motionless â€“ hunkered down for the winter. To survive, she must weather the coldest temperatures either rover has yet faced and collect enough solar energy to awaken. "We've lost contact," says Arvidson. "The sun has been too low for the rover to collect enough power to stay in touch with Earth. She's merely surviving now." May 14th was winter solstice in Mars' southern hemisphere, where Spirit is waiting for the sun to provide a much-needed dose of solar power. "In September or October the sun will be high enough for Spirit to wake up, hear us, and 'talk' to us. I won't be greatly surprised if she wakes up and says 'I'm here. What do I do next?'" At present, however, no one knows if Spirit will ever get to hear her next assignment--or whether Opportunity will complete the marathon trek to Endeavour. 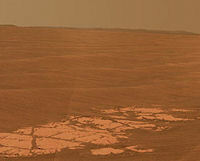 Note: Opportunity's twin rover, Spirit, began working on Mars three weeks before Opportunity. However, Spirit has been out of communication since March 22. If it awakens from hibernation and resumes communication, that rover will attain the Martian surface longevity record.